Glow Fish - First Genetically Modified Fish on Aquarium Market! Glow Fish – First Genetically Modified Fish on Aquarium Market! When researches in Singapore spliced the fluoresce gene into the eggs of Zebra Danios, the result was the world’s first glow in the dark pets: Glow Fish! These shimmering, brightly colored fish resembling other species of zebra fish or Neon Tetra, actually glow under black light. First created to aid scientists in tracking the course of pollutants through water, the Glow Fish were then used as educational tools in the classroom. 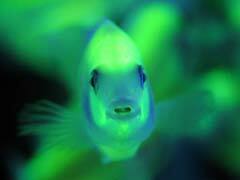 When word got out about these glow in the dark fish secret demand began to build for them to arrive in pet stores. Professor H.J. Tsai never intended his creations to reach a mass market, but when a Taiwanese fish supply corporation made him an offer, he accepted. Now these marvels of science can swim alongside your own freshwater aquarium fish. The Glow Fish have recently arrived on the American market, and are swimming their way into pet stores elsewhere as well. Of course, with genetically modified pets comes any number of protests from environmental and ethics groups. Will animals become “designer” pets? Is tampering with genetics really safe? These are disagreements the distributors of Glow Fish try to quell. According to the Glow Fish site, when purchased these fish are completely sterile. This makes the possibility of Glow Fish breeding in the wild (or by consumers) an impossibility. Wild populations of fish would not be affected. For many, fish swimming and shining under black light is not a pressing moral decision. If the demand says anything, it is that the public is ready for Glow Fish.